Join us in supporting those who are fighting breast cancer and their loved ones. 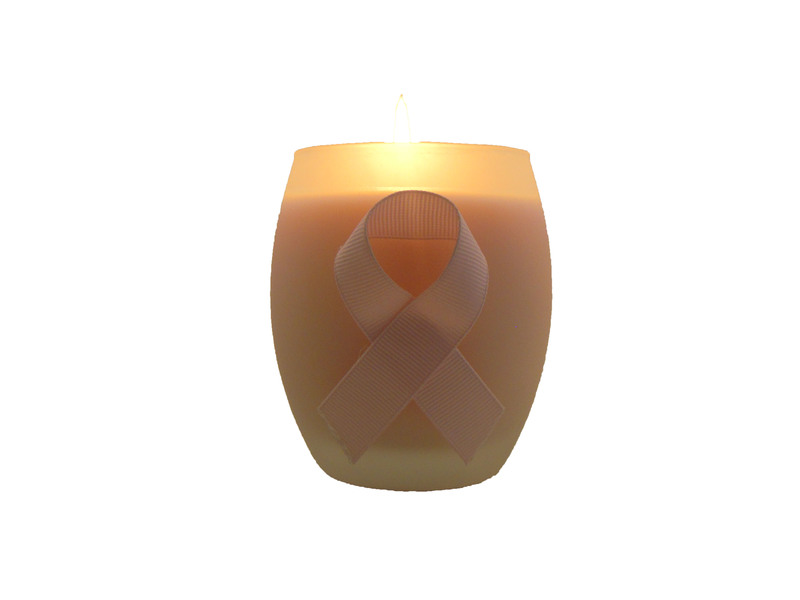 Noir Naturals will be donating a portion of th e proceeds from the sale of our Pink Candle to an organization that is close to our hearts. Gift of Hair is a non-profit organization that donates hair and wigs to those suffering from hair loss caused by treatment for a medical condition. GOH provides assistance to cancer/chemotherapy patients, and anyone who suffers from hair loss, caused by treatment for a medical condition. Learn more about the organization and its mission on Facebook. The Pink Candle has a 40 to 60 hour burn time and has the fragrance of fresh-cut roses. It’s made from 100% soy wax from soybeans grown in the U.S. You can purchase it at House of Panache in Covington, LA, online, and at one of our upcoming craft fairs. If you’re in or near Metairie, Louisiana this Saturday, come see us and help support some high school seniors. The Archbishop Chapelle High School Craft Fair is in its 11th year. Join us and over 150 other vendors of handmade goods and original works of art as we present our wares. Proceeds benefit the school seniors’ prom fest and prom. The weather is expected to be perfect this weekend, so why not start it with us? We’ll have a selection of Noir Naturals favorites, including our Moses, Key Largo, and unscented Age of Innocence soaps. The fair will be held at 8800 Veterans Memorial Boulevard, starts at 9 am, and ends at 5. See you there! Noir Naturals is all natural. This is the first in a series of posts that will describe our prime ingredients and why we use them. When we say our products are all natural, we mean it. Essential oils, goat’s milk, shea butter, coconut oil, palm oil from sustainable sources, castor oil, olive oil, Calendula flowers, and soy wax are used to create the lotions, soaps, candles, scrubs, and body butters in our inventory. What you won’t find are artificial colors or preservatives. None of our personal care products include anything from The Campaign for Safe Costmetics‘ list of top ingredients to avoid in personal care products. These ingredients have been linked to a number of health issues and do nothing for one’s hair or skin. Parabens are of particular concern. Did you know that they have been linked to weight gain and breast cancer? They mimic estrogen and are absorbed into the skin. In fact, traces of parabens have been found in tumors during biopsies, cause breast cancer cells to grow in vitro, and have been found in urine samples in adults. While the FDA has not banned the use of parabens in cosmetics, it is aware of the negative affects and continues to monitor study findings and evaluate the risks. Why wait for the FDA to make a ruling? Go natural and avoid those risks. Back in the day, there were no artificial additives in Great-Grandma’s handmade soap. We are following her example. Those of you who haven’t made the switch should give it a try. Try a bar of our soap or bottle of our lotion and you may never go back to traditional products again. Will you be there, too? Noir Naturals will be a vendor at the Biloxi Seafood Festival on Saturday and Sunday, September 10 and 11. We’ll have samples and testers available and items for sale. Be sure to try our new products. Suspicion Goat’s Milk Lotion features a Victoria’s Secret-inspired fragrance, and our Lake Noir soap will remind you of a fresh mountain stream. Ever had a week of Mondays? It seems this one might one of those, so I'm arming myself with my favorite Monday-fighters. When the case of Mondays can be measured by the number of coffee pots it takes to wake up, you know you’re in trouble. See a two- or three-pot day ahead? Instead of downing those pots, start the day with a bang. Noir Natural’s Bang! Bang! Tea Tree and Peppermint Soap wakes you up without making the caffeine jitters. The goat’s milk base moisturises and poppy seeds exfoliate while the morning brain fog washes down the drain. Instead of the 4 pm sugar and caffeine fix, reach for Blue Dahlia. This rich and refreshing eucalyptus and spearmint blend helps push me to the end of the workday. It’s awesome on tired feet, too! To relax after a long day, reach for the eucalyptus and lavendar Great Escape calms my mind and takes me away. Our products are paraben-free, never tested on animals, and contain no pigments or dyes – just like they were back in the day.